Despite playing in the top district in class B, the Turpin Cardinals have won more than they have lost. A year ago the Cardinals won a playoff game and went 7-5 after they were 8-3 in 15 and 7-4 in 14. Turpin will have to re-load in 17 if they are to continue their winning ways. Justin Hannah is back for his fifth season as head coach. But he has three new assistant coaches and a lot of new faces behind Turpin helmets. The Cardinals have four starters back on both sides of the ball and 19 out for football. But they lose six seniors, many of whom were three year starters. 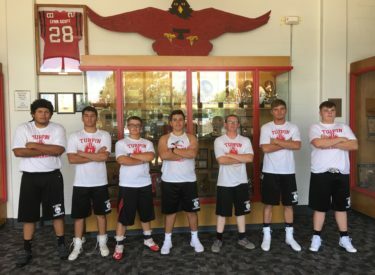 Some of the key Cardinals are Sr. OL/DT Juan Dominguez, Sr. lineman Dawson Kinser, Sr. QB/RB/LB Caleb Olson, Jr. TE/DE Alex Lopez, Sr. WR/DE Brady Palmer, Jr. QB/DB Isiah Vallalobos, and Sr RB/LB Logan Lumas. Turpin’s seniors and coach Justin Hannah will be guests during the Monday Sportsguys from 7:37-9 on 1270 and kscbnews.net.